The number of households receiving BS broadcasts, which includes BS analog and BS digital reception, was about 16.51 million at the end of March 2003. And the number of households receiving BS digital broadcasts was more than 6 million at the end of June 2004. The most important role for B-SAT as a BS broadcasting infrastructure enterprise is to control and manage the five broadcasting satellites and to uplink digital programs stably, so that a huge number of people can receive BS broadcasting programs without any interruptions. If any trouble should occur in the BS satellite system, we must quickly and accurately explain the problem and report our investigation results and measures to prevent reoccurrence to program-supplying broadcasters and related organizations. We cannot function without the trust of customers, both BS broadcasters and viewers. I always tell employees to keep this in mind and to cope with the stress. Mr. Eddie Kato is Vice President at Orbital Sciences Corporation of USA, responsible for business development activities of communications satellite systems worldwide. Since he entered into Orbital in 1998, he and his team have played vital roles for all of the 11 geostationary satellites awarded to Orbital to date. Prior to Orbital, Mr. Kato worked for Mitsubishi Electric Corporation, Lockheed Martin Corporation as well as Japan Image Communications Corporation. Mr. Kato currently resides at Potomac, Maryland with wife and two children. 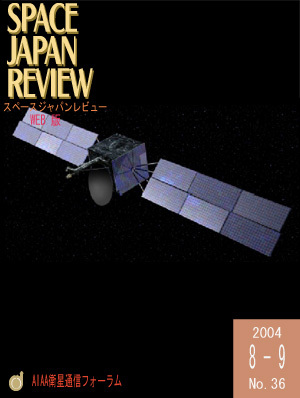 Pertaining to the Homeland Security and the Space Development of Japan, with focusing on my opinions stated at Space policy Committee of The Society of Japanese Aerospace Companies (SJAC) in Dec. 19th 2002 and Dec. 24th 2003 respectively, I would like to summarize my opinion again by gathering the homeland security and security of industry, proposal of foundation of the space development organization of Asia Pacific Area and etc,. I am more than happy if I can listen to the opinions from whom it may concern. "I received a lot of e-mail messages of congratulations and appreciations on the day after the success. I still keep the messages. They are the proofs that if I never give up, I will reach my goal. They will give me a push to meet another challenge, which I am going to face. We have reached a long-haul destination of "realization of intersatellite communications", but we still have a long way to go. I think that my involvement in satellite communications will not end yet. I am going to continue to be in the field of intersatellite communications for a time. I will go ahead and build up my experience, looking forward the day I step into another new world of satellite communications." Broadcasting Satellite System Corporation (B-SAT) received a preliminary license for broadcast operations of BSAT-3a (the post-BSAT-1a satellite) from the Ministry of Public Management, Home Affairs, Posts and Telecommunications on June 9, 2004. B-SAT will develop an active business as a consignee broadcaster aiming to launch the satellite and beginning satellite operation in 2007. This article outlines B-SAT's business goals, present business activities, and equipment, touching on B-SAT's history.